I’ve been interested in PCCs recently. They’re a type of streetcar that was designed by the Presidents’ Conference Committee in the 1930s and were primarily used during through the 1960s. San Francisco’s F Market line runs a lot of these along with some mostly wooden antique and Milan cars. 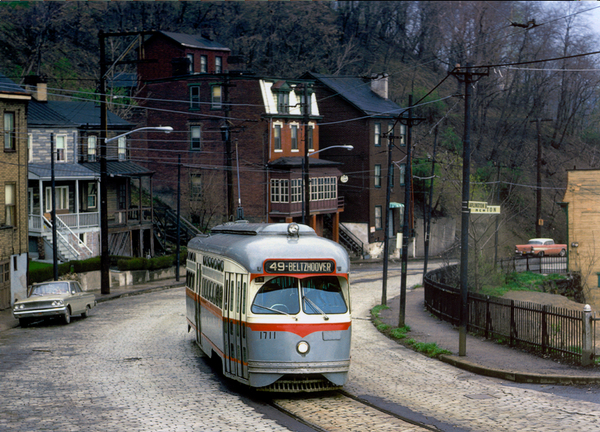 I found recently that Pittsburgh had one of the largest PCC fleets in its heyday. There are a number of great photo galleries of old Pittsburgh PCCs in action. 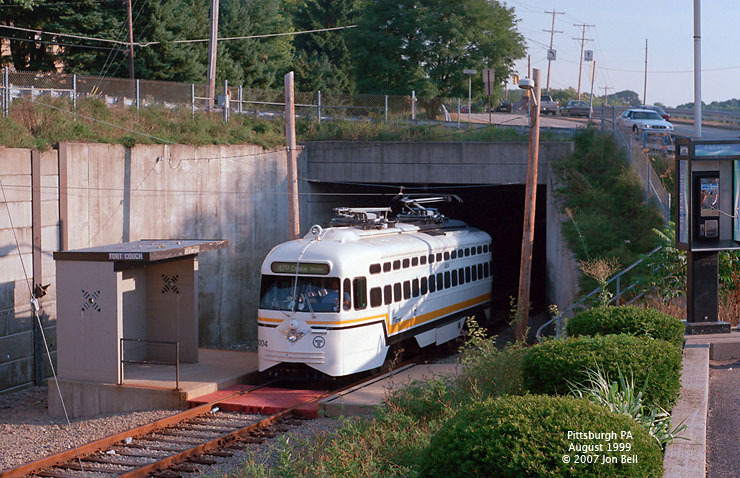 Interestingly enough, Pittsburgh actually ran PCCs in a limited context until 1999 on the 47D Drake Loop line. Here’s a great page about that loop and here’s a photo gallery of the last days of that line. I believe some of the last PCCs were running along this line, though I’m not sure where I read that now. Apparently ridership dwindled to 50 passengers a day at the end. Market Street Railway, the non-profit that restores PCCs for the F Market, bought two of the last three cars, though they need to converted to appropriate wheel gauge before they’re usable. I really hope they keep the 90s white-black-and-gold paint job you see below. In one last PCC oddity, the Ashmont Mattapan line in Boston is the last non-historic use of PCCs in the US. The line also runs through a cemetery. I should ride it next time I’m in Boston. I’ve been meaning to check out the Red Line extension to Mattapan for awhile but I’ve never had any reason to go that far south. I should schedule a trip for the sole purpose of riding a PCC before we move away from Boston. If I do, I’ll take some pictures for you. I know nothing about this stuff, but I am pretty sure I was on some of those a few months ago in Prague.